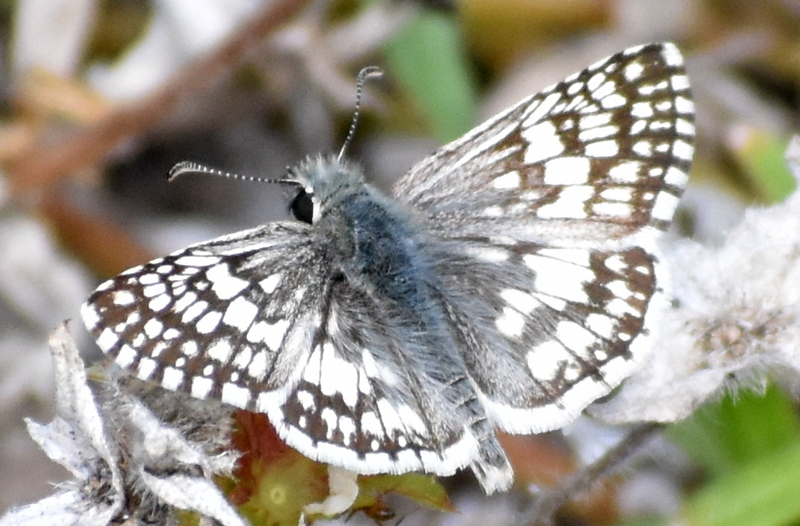 Identification: Paler than Pyrgus communis. Male often has complete black checks in wing fringes. Upperside of male is blue-gray; female is black. Both sexes have large white spots which form median bands across both wings. 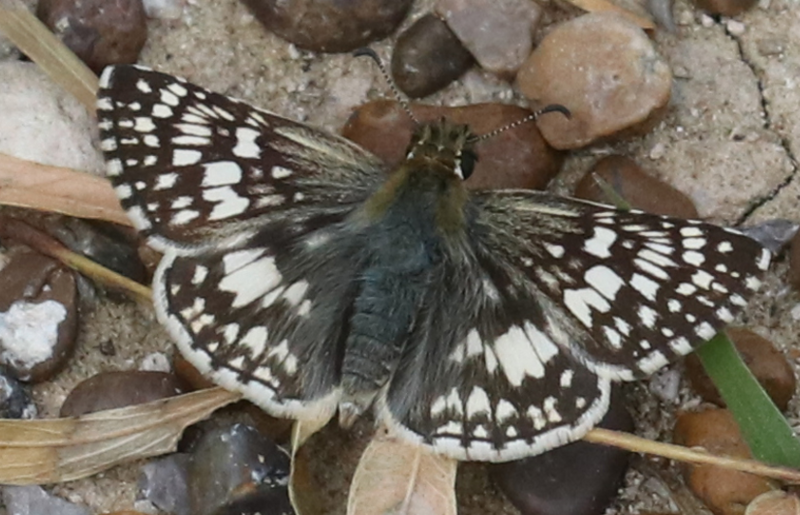 Male has a costal fold enclosing scent scales on the upperside of the forewing. Underside is dull white with dark gray bands. Positive identification can be made only by dissection and scrutiny of the male genitalia. Wing Span: 1 - 1 1/2 inches (2.5 - 3.8 cm). 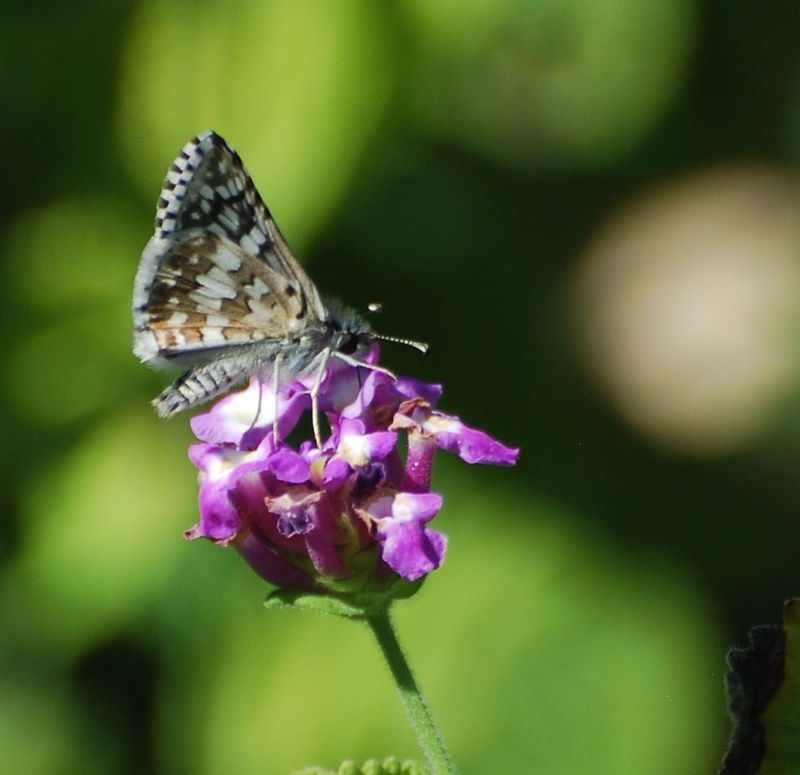 Life History: Similar to that of Common Checkered-skipper. Flight: All year in South Texas, most of the year elsewhere. Caterpillar Hosts: Not reliably reported. Probably several plants in the mallow family (Malvaceae) including globemallows (Sphaeralcea), velvet-leaf (Abutilon), and poppy mallow (Callirhoe). Adult Food: Nectar from a variety of plants. Habitat: Open, sunny places with low vegetation and some bare soil including prairies, fields, roadsides, yards, gardens, and low deserts. Range: Low altitudes in southern California, southern Arizona, southern New Mexico, west and South Texas; Florida, and Mexico. A rare stray to southwest Utah, and central Texas.